This morning we drive to Soweto where we have a local guide join us parting his intimate knowledge and experience of the largest ‘township’ in Africa. We visit Soweto Township, Freedom Square and Hector Pieterson museum and memorial. A walking tour and drive will take you to various points of interest like the home of Nelson Mandela, Desmond Tutu, Winnie Mandela and the FNB stadium. We lunch in a well known African restaurant on Vilakazi Street. The most visited street in Soweto. Home to the late former present, Nelson Mandela and Archbishop Desmond Tutu, who still resides there with his wife Leah. We can, time permitting visit, Lilliesleaf where Nelson Mandela was captured which lead to the famous Rivonia trial. From here to Constitution Hill, you discover the secrets of the past and the tales of the true struggle for freedom. Depart for the beautiful Blyde River Canyon in Mpumalanga. Follow the scenic Panorama Route and admire God’s Window, Three Rondavels, Blyde River Canyon, Long Tom Pass, the battlefields, Bourke’s Luck Potholes and the various Canyon waterfalls. Pilgrim’s Rest is an authentic historical village dating from the first South African gold rush and now a National Monument. Accommodation is on the edge of the canyon. 5 h 49 min via N12 (5 h 22 min without traffic). On arrive in the late morning at the famous Kruger Park and begin your visit with lunch on the banks of the mighty Sabie River. A glorious 4×4 sunset safari with professional ranger pursuing the Big 5 and other rare and endangered species. Enjoy a great barbecue dinner. Accommodation in National Park chalets. 1 h 22 min via R40 (1 h 22 min without traffic). Around 4.30 am you can leave camp for a 3 hr morning 4×4 safari with a professional ranger to witness the African Savannah and wildlife in all its splendour. Return to camp for a hearty breakfast followed by a full day safari with your guide. Accommodation in National Park chalets. Depart for the Kingdom of Swaziland (passport required). The landscapes are very similar to those of Switzerland. You can visit the Ngwenya Glass Factory and the oldest mine in the world. At Mbabane, capital of Swaziland you can see the Royal Palace, Parliament, the Kings Mausoleum and a craft market in the Ezulwini Valley. Overnight “hotel de charme” bed and breakfast, dinner included. After breakfast we visit the Swaziland candle factory and “House of fire”. Before departing for St Lucia situated along the tropical coast of Zulu land. En route we visit a typical Swazi village and orphanage run by a lady who has no NGO or governmental aid but some how has given hope to many orphan children. An authentic experience that will leave us with fond memories of her courage. lunch on the way. Upon arrival we take a cruise (included) on the St. Lucia wetlands, home to a multitude of the most diverse ecosystems in the world and a World Heritage Site. It is in this complex ecosystem where bush meets beach, mangrove and sand forests are home to a stupendous diversity of wildlife and flora. We have the opportunity to encounter hippos, crocodiles, eagles and maybe even the elusive leopard. Luxury B&B in the heart of the St Lucia wetland park. Early morning start for St Lucia for Hluhluze / Umfolozi Park, the 2nd oldest national park in the world and home to the “B5″ and also renowned for saving the white rhino from extinction. You will spend the day exploring this vast reserve accompanied by a professional ranger in a 4×4.Late afternoon you return to St Lucia village. Dinner is at a restaurant of your choice. Then the Mandela Capture Site, where the late Nelson Mandela was arrested in 1962 before the famous Rivonia trial when he was sentenced to life imprisonment and sent to Robben Island. A monument commemorates this event that changed the course of history. Many offered and optional activities are available in this region. Which may vary depending on where you are situated or would like to be situated in the Drakensberg. We can opt for an optional 4×4 excursion (highly recommended) and visit Lesotho for the day, via the Sani Pass, the highest in Africa, or similar if situated in the Northern Drakensberg. We can choose to go on a guided hike to the famous cave paintings left by the Bushmen of about 4000 years Trek to the Tugela Falls, the worlds highest. We visit the Golden Gate National Park, with it’s unique sandstone rock formations and wild life, browse around the pretty town of Clarence, with it’s many little restaurants. Visit the historic battle fields of the 18th century where the English, Afrikaans and Zulu armies, engaged in bloody battles. After breakfast you will set off for the Wild Coast one of the most unspoiled parts of the country where the population still lives in an authentic and traditional way. You will have the opportunity to visit Umtata and Nelson Mandela Museum, and a few miles away, Qunu, a small village where Nelson Mandela grew up and now hosts his final resting place. You will learn about the legends that have affected the course of history. Lunch finally you reach Coffee Bay, a haven for swimming, fishing and lazy occupations. This coastal is home to beautiful beaches, estuaries, lagoons and indigenous hard wood forests. Hotel accommodation on the beach. After breakfast you can take a hike along one of the most stunning coastlines in the world dotted with Xhosa huts and ‘kraals’ Fresh crayfish and oysters are on offer on the way. They will literally prepare it on the beach, where else can you expect such a delicacy at an incredibly reasonable price. On our way to the “Hole in the Wall” a natural wonder, where the sea has tirelessly dug a hole in the cliff. The coast on either side of the Hole in the Wall is precipitous and notorious for the number of shipwrecks. On return you may relax on the beach or take the opportunity to visit another prime ‘spot’ on this magic coastline. Accommodation at the hotel which is on the beach. Dating back to the 1800’s, the charming and vibrant village of Hogsback is high up on the Amathole Mountains of the Eastern Cape, overlooking the rivers and slopes of the Tyume Valley. Hogsback offers you a welcoming peace and tranquillity, and plenty to do and see. It is named for its 3 flat-topped Hogsback Mountains. 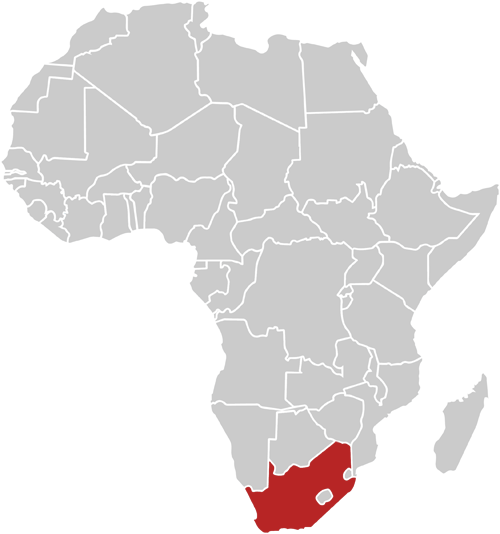 It is said that the Amatola Forest, was the inspiration for SA born author, J. R. R. Tolkien’ famous The Lord of the Rings, and the Hobbit books and series, hence the many Tolkienesque names. Activities: From aromatherapy massages to adrenaline filled activities, abseiling, bird-watching, more than 150 species, including Cape Parrot, Knysna Loeries, etc. The Amatola Mountains present the visitor with artistically wind-carved rock formations and other shapes such as bell rocks. Mist forests have also formed as a result of moisture in the higher regions. 4 h 50 min (378 km), via N2 and R63. (4 h 27 min without traffic).). After breakfast you can besides the many nature based activities (trout fishing, horse riding, mountain biking, hiking, river rafting) visit special places, like Diane Graham’s International Award-Winning Echo Shrine, the world famous gardens, like Applegarth, with its exotic plants from all over the earth, the magic of Camelot Fairy Meander, a Chartres design Labyrinth, one of the largest in the world, St. Patrick’s on the Hill Chapel, Robinson dam, the Bird sanctuary, the Arts & Crafts route and more. Nearby places: Take a drive via the Hogsback Pass for panoramic views of the Tyume valley and beyond, where you will see the “three Hogs”, and at a height of 1700 m, the top of Gaika’s Kop. Here you have views of the Elandsberg mountains Seymour valley and to the coastline 120 km away as the crow flies. Travel to Graaff-Reinet, a stylish town in the Eastern Cape and the only town in South Africa that is surrounded by a national park. Founded in 1786, in a bend in the Sundays River, this historic Karoo town is the fourth oldest settlement in South Africa. It is a vibrant tourist destination with over 200 historical buildings and more national monuments than any other town in the country. 3 h 25 min (297 km) via R63. After breakfast you take a relatively short drive to the wonderful Addo Elephant National Park, a diverse wildlife conservation park which is one of the country’s 19 national parks. It is famous for the “Big Seven”, “the Big Five” plus whales and sharks! But especially the magnificent elephants we will encounter at the waterholes. This afternoon you safari at the beautiful Schotia private game reserve with a professional ranger in a 4×4. (optional activity) Refreshments, tea, coffee and wood-fired baked rolls. 1 h 35 min via R75. Enjoy the park at your leisure. Before leaving town, admire the view from “The Heads”, two cliffs that form a narrow passage at the entrance to the lagoon. Discover lush green coastal forests where once many elephants lived. A short drive brings you to the outskirts of Plettenberg Bay, a small luxurious resort town. View the famous Bloukrans Bridge where bungee jumping is the highest in the world. At the Tsitsikamma National Park you can walk in the indigenous forests and cross the mouth of the river on a suspension bridge. Beautiful scenery of the dramatic coastline. Leaving the Tsitsikamma area you can stop to admire the “Big Tree” an ancient tree in ironwood with impressive dimensions. The next stop will be in the town of Jeffrey’s Bay a surfer’s paradise where you can enjoy shopping at Billabong and Quicksilver factory shops! 3 h via N2. (2 h 50 min without traffic). This route has tolls. The town of Oudtshoorn is the capital of the Little Karoo, renowned for its spectacular arid landscapes, fossil finds, succulents, desert plants and of course as the Ostrich Capital of the world as well as home to one of the world’s most spectacular cave systems. A visit to the world’s oldest working Ostrich farm for a tour and an opportunity to ride on one of these strange birds. Here you have the opportunity to taste the world’s finest Ostrich steak. 3 h 45 min via R62 and R319 (3 h 31 min without traffic). After breakfast, depart for Agulhas at the southernmost point of the continent and also renowned for its ancient Khoisan fish traps. Where the Atlantic and Indian Oceans meet. Cape Agulhas describes in Portuguese the sharp rocks which threatened the route to India for navigators of old. We then drive onto Arniston, a ”jewel” on the east coast, with it’s emerald sea and white sand dunes, a late afternoon swim or if low tide a short hike into the sea cave. Dinner on the beach in a fisherman’s cottage in the authentic fisherman’s village, or an African barbecue, weather dependent. Hermanus is known as the world’s best land based whale watching spot between the months June to December. Enjoy this charming village at your leisure. Walker Bay, a protected bay, offers privileged vantage points to view the Southern Right whales that come very close to our shoreline to calve every year during the austral winter. An option and highly recommended is a cruise in the bay in order to observe these magnificent giants more closely. Continue to Stoney Point in Betty’s Bay, home to Africa’s larger and lesser known penguin colony. You then wind your way along the spectacular Clarence drive on your way to Cape Town. 1 h 38 min via N2 (1 h 29 min without traffic). This Region is a UNESCO World Heritage site for its exceptional floral diversity. Follow the west coast via Clifton with a stop at Maiden’s Cove to enjoy a magnificent view of the Twelve Apostles and Camps Bay then to Hout Bay, a charming little town where you can enjoy a boat cruise to Duiker Island, home to the world’s largest fur seal colony. The scenic Chapman’s Peak Pass offers breath-taking scenery. The Cape of Good Hope Nature Reserve is where the cold Atlantic waters meet the warm waters of the Indian Ocean. This famous landmark was named by the early Portuguese mariners. Journeying down to the False Bay coast, lunch is at the old harbor of the historical naval port of Simon’s Town. You can finish your day with a visit to Groot Constantia, South Africa’s oldest Cape Dutch manor house and wine farm built by the first Governor of the Cape. Dinner at a restaurant of your choice. Drive to Stellenbosch, a fertile area where oak trees, wheat and vines quickly replaced the giraffes, elephants, Hottentot and Khoisan peoples. You can visit a museum, historical shop and partake in a cellar tour before traveling over the beautiful Hels Hoogte Pass on our way to Franshhoek. Visit the Huguenot Museum. At an exceptional boutique wine farm you can taste local vintage including a pinotage, which is South Africa’s own unique cultivar. At Paarl you stop in front of Mandela’s statue at the entrance to the prison from which he was liberated in 1990. Today you can visit Cape Town, historical places, parks, Dutch East Indian Garden, Castle, South African Museum, Malay quarter, District 6 and Green market square. Before noon you can also visit the noon gun in action on the slopes of Signal Hill. It is the world’s oldest canon still in action. After lunch you can visit Kirstenbosch National Botanical Garden, the only botanical garden situated in a world heritage site which has more endemic plant species than any other in the world. Tonight, enjoy an authentic ‘farewell’ African dinner of many culinary dishes from across the continent. Traditional African dance, music & theater accompany your ‘farewell’ meal. Like the half day trip and tour of Robben Island, Table mountain, the Zeitz Museum of Contemporary Art Africa or even the Two Oceans Aquarian.